Saint Columba was an Irish monk who spread the Christian faith in Scotland and Northern England. He was a wonderful poet and the best copyist and illumination artist of his time. He founded many churches and monasteries, but his most famous monastery was on the island of Iona. He taught the monks to illuminate the word of God, this meant to decorate the words with beautiful designs, borders and pictures. The most beautiful illuminated manuscripts come from Ireland and Scotland. Saint Columba's monks handed their methods down through the generations. In medieval times the Columban monks at Iona created the most beautiful, most famous illuminated manuscript of all time, it is called the Book of Kells. It contains the four Gospels in Latin along with several other passages. The pages are decorated with incredibly intricate Celtic borders entwined with beautiful birds, animals, flowers, figures and faces. This book is often called the Book of Columba in honor of the father of these incredibly skilled artisans. It is preserved today as Ireland's greatest national treasure. As soon as he was old enough, Columba was taken from the care of his priest-guardian at Tulach-Dugblaise, or Temple Douglas, to St. Finnian's training school at Moville, at the head of Strangford lough. He was about twenty, and a deacon, when he left to study in the school of Leinster under an aged theologian and bard called Gemman. 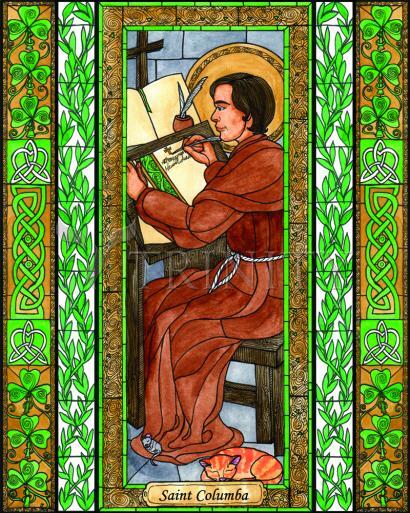 With their songs of heroes, the bards were the preservers of Irish lore, and Columba himself became a poet. Still later he attended the famous monastic school of Clonard, presided over by another Finnian, who in later times was known as the "tutor of Erin's saints." At one time three thousand students were gathered here from all over Ireland, Scotland, and Wales, and even from Gaul and Germany. It was probably at Clonard that Columba was ordained priest, although it may have been later, when he was living with his friends, Comgall, Kieran, and Kenneth, under the most gifted of all his teachers, St. Mobhi, by a ford in the river Tolca, called Dub Linn, the site of the future city of Dublin. In 543 an outbreak of plague compelled Mobhi to close his school, and Columba, now twenty-five years old and fully trained, returned to Ulster. He was a striking figure of great stature and powerful build, with a loud, melodious voice which could be heard from one hilltop to another. For the next fifteen years Columba went about Ireland preaching and founding monasteries, the chief of which were those at Derry, Durrow, and Kells. The powerful stimulus given to Irish learning by St. Patrick in the previous century was now beginning to burgeon. Columba himself dearly loved books, and spared no pains to obtain or make copies of Psalters, Bibles, and other valuable manuscripts for his monks. His former master Finnian had brought back from Rome the first copy of St. Jerome's Psalter to reach Ireland. Finnian guarded this precious volume jealously, but Columba got permission to look at it, and surreptitiously made a copy for his own use. Finnian, on being told of this, laid claim to the copy. Columba refused to give it up, and the question of ownership was put before Ring Diarmaid, Overlord of Ireland. His curious decision in this early "copyright" case went against Columba. "To every cow her calf," reasoned the King, "and to every book its son-book. Therefore, the copy you made, O Colum Cille, belongs to Finnian." Columba was soon to have a more serious grievance against the King. Prince Curnan of Connaught, who had fatally injured a rival in a hurling match and had taken refuge with Columba, was dragged from his protector's arms and slain by Diarmaid's men, in defiance of the rights of sanctuary. Iona was for centuries one of the famous centers of Christian learning. For a long time afterwards, Scotland, Ireland, and Northumbria followed the observances Columba had set for the monastic life, in distinction to those that were brought from Rome by later missionaries. His rule, based on the Eastern Rule of St. Basil, was that of many monasteries of Western Europe until superseded by the milder ordinance of St. Benedict. Adamnan, who must have been brought up on memories and recollections of Columba, writes eloquently of him: "He had the face of an angel; he was of excellent nature, polished in speech, holy in deed, great in council. He never let a single hour pass without engaging in prayer or reading or writing or some other occupation. He endured the hardships of fasting and vigils without intermission by day and night; the burden of a single one of his labors would have seemed beyond the powers of man. And, in the midst of all his toils, he appeared loving unto all, serene and holy, rejoicing in the joy of the Holy Spirit in his inmost heart."